Sig 9mm P228 P229 ProMag 13 round Magazines New Old Stock 00644 SigA3 New Old Stock Buy 3 Ships Free! 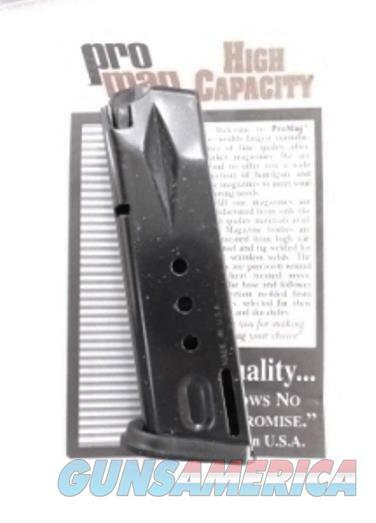 Description: Restrictions apply to higher capacity magazines in many jurisdictions of the United States, so please read this entire ad carefully before offering to buy. This listing is for ONE Magazine. Combine any 3 of our non gun non ammo items, and shipping is FREE on the entire order, lower 48. From a few years’ storage in an old Southern Warehouse come these Unissued, unfired blue steel magazines to fit Sig P228 pistols chambered in 9mm caliber. Manufacturer and warrantor is Pro-Mag Industries, 10645 Garfield Ave., Southgate, CA 90290, and this company advertises a lifetime Factory warranty on each item. Please understand that warranty service is between the consumer and the factory. Construction is blue steel body, steel spring, black polymer cartridge follower and matching floorplate. Each Magazine holds 13 rounds of 9mm ammunition. These will only fit Sig model 228 and 229 pistols chambered in 9mm that accept a double staggered magazine. They will not fit a 226, will not fit a 239, Will not fit a Smith & Wesson 469; will not fit the valve handle of a 19th century Italian Bidet. All these magazines are new and unfired in their original factory packages, only old stock. One of our veteran local customers gives the Pro-Mag an A, from cycling 117 rounds through it with no failures to feed, just one failure in 9 cycles to lock the slide open on the last shot, not really a consideration in our view. Replacement pricing on promagindustries com is $25.00. We're offering them each, however, for only	$ 9.00. Not for sale to civilian residents of California, Connecticut, District of Colombia, Hawaii, Maryland, Massachusetts, New York, or any other jurisdiction where 13 round magazines are restricted to Law Enforcement only.